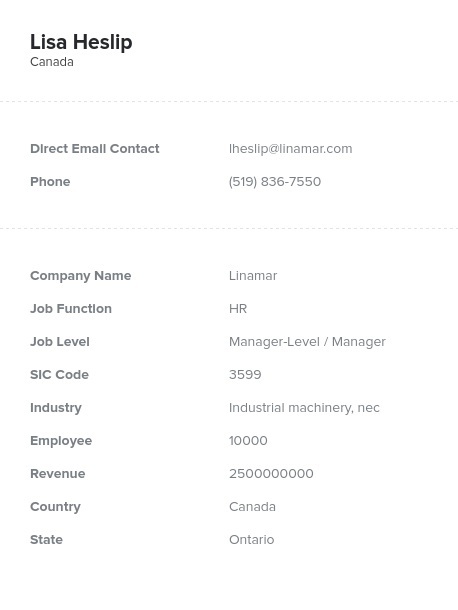 Connect directly with your target audience with our human-verified Canadian VP of human resources email database. When you buy and download this business contact list, you'll get instant access to the contact information of Canadian HR department professionals in charge of recruiting and staffing. Human resource departments are responsible for recruiting, screening, and placing employees. They may also handle payroll, employee relations, and other employment issues concerning workers, such as training and benefits. When you buy and download our Canadian human resources (HR) director email list, you'll gain instant access to a comprehensive business database containing valuable contact information. This human resources manager mailing list contains the names, numbers and addresses of many professionals in HR departments, including staffing executives, recruitment managers, and employment directors. Our bulk email list contains the contact information of Canadian HR chiefs in a variety of industries across the country, so your marketing effort can have a wide reach. Contact these decision-makers directly and offer your products, services and solutions. At Bookyourdata.com, we offer a ready-made mailing list of HR executives in Canada as well as a list-builder tool with which you can easily build your own business list. With the tools needed to effectively grow your business, you can begin generating sales leads and connecting with people in your target industry who can help increase your bottom line. Buy and download our human-verified Canadian managers of human resources email list today and you'll be closing more deals in no time.